Share This Site and Help Others to Discover the Wonderful World of Cooking With Fire! I love that I have the opportunity to share one of my passions with visitors from around the world. But it can be hard to reach everyone who may be interested in the experience I have to share. So can I ask a favor of you, my visitors? If you enjoy this website and found my tips, instructions and other information helpful or useful, please consider sharing it with others so that more visitors can benefit. The more people that discover this site the better, not only for me, but for all our visitors. Why? Because I set out to share as much information and ideas about fire pit, grilling, fireplaces and everything to do with cooking with fire as possible with as many people as possible, for free! By promoting this site you are giving me the opportunity to bring it to a wider audience. In return, many of our visitors make significant contributions, contacting me with new ideas, recipes, tips and photos which I can share with you. 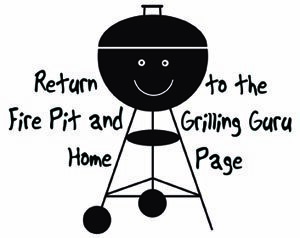 So please share this site with your friends and family in one of the following ways so that they can enjoy the Fire Pit and Grilling Guru as well. In advance, thank you from www.firepit-and-grilling-guru.com and be sure to let me know if you have any comments or questions about my site! Click here to share this site by email! Link to us! If you have a website or blog, simply select the link you would like to use below, copy the HTML code provided in the boxes and paste it anywhere on your website or blog. The links will open in a new window so that your website or blog stays open underneath it so that you do not lose any of your visitors! Want to build an outdoor firepit? How about learn to put your barbeque, fire pit, indoor grill or even your fireplace to work to make a delicious meal? We’ll you’ve come to the right place! With this HTML code, you do not need to download the banner graphic. It's stored on our website and will display on your site exactly as you see it here. Return to the top of the Share This Site page.